(CNN) -- Through a smoky haze, flames continue to dance around the remains of a house, a shed and the blackened trunks of trees on remarkable video footage filmed moments after a firestorm swept through the rural Victorian town of Kinglake, Australia. 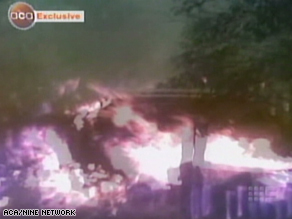 Images from disturbing video of the Australian bushfires filmed by resident Brad Price in Kinglake, Victoria. Resident Brad Price is holding the camera, providing a slightly breathless commentary of the destruction of his home and town as smoke clogs his throat and blurs his vision. "Everything's gone. I'm over at Kylie's house which is next door. Every house around us has burnt down," he tells the camera. He turns the lens on himself to show a reddened, peeling face. "I burnt all me face, trying to fight the fires. I did as much as I could. I saved my dog, that's all I was worried about." He commandeered an abandoned utility and took at least one dozen of his neighbors to safety. Price, his face swollen and bandaged, told the Nine Network that he sent his partner Erin and her three children away before the firestorm hit. The policy was introduced after the country's previous worst fire outbreak in 1983 when 75 people were killed on a day remembered as "Ash Wednesday." "The idea is that people think about their circumstances and if their house is defendable -- and that relates to a number of factors -- prepare themselves and their property and protect it in a proactive way," Professor John Handmer said in an interview on Australian radio. Professor Handmer, director of the Center for Risk and Community Safety at the RMIT University in Melbourne, is currently reviewing the fire policy on behalf of the Bushfire Center for Research. "It's often very difficult unfortunately to know when you should be going. Our studies have shown that often people will unfortunately wait and see and leave when they think the fire is close," he told the ABC. "When the fire's moving very rapidly, that is dangerous. We believe we need to be more assertive than that," he added. "Given the new climatic conditions in which we're operating, the fire protection and fire preparation measures that are in place are going to have to be of a much higher standard than we've seen in the past," said Victorian Premier John Brumby. Temperatures in parts of Victoria reached 48 degrees Celsius (118 degrees Fahrenheit) in the weeks leading up to the blaze, creating tinder box conditions in large parts of the state. Price told the Nine Network he abandoned his attempts to defend his home when the power failed, rendering his water pump useless. After hours searching the charred and smoking streets for survivors, Price phoned his brother who defied police roadblocks to rescue him. "My brother said he's on his way. When he says he's on his way, I know he'll commandeer a helicopter and he'll pull in there and he'll get me," Price told the Nine Network. iReport.com: Are you there? His brother Wes found him lying on the ground in the front of the pub with the dog. Asked whether he wanted to go back to what remains of his home in Kinglake, Price told the Nine Network: "If you saw what I saw you'd never want to go back there. I won't be able to drive down the street. I saw things that people should be trained to see. But I went and did it, so I'll live with it."